JALALABAD, Afghanistan (AFP) -- At least nine people were killed and more than 30 injured when militants detonated bombs and stormed a government building Sunday in a continuing attack in an eastern Afghan city, officials said. A thick column of smoke rose into the sky after two explosions near Jalalabad‘s directorate of finance, the Nangarhar provincial governor’s spokesman Attaullah Khogyani told AFP, adding that “a number of attackers” had entered the building. “Security forces are in the area chasing and fighting them,” he said, adding that one attacker “is down” and the clearing operation was continuing. 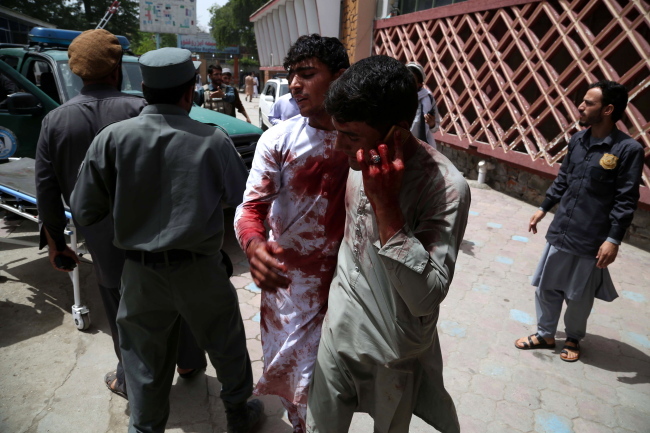 “Around noon a big boom shook our building,” Qaisar told AFP from a Jalalabad hospital. “I then saw at least two armed attackers entering the building. My friends ran to hide and I jumped from a window. The body of a policeman and eight civilians, along with 36 wounded people had been brought to hospitals in Jalalabad, said Dr Najibullah Kamawal, director of the city health department. There was no immediate claim of responsibility for the attack. Jalalabad is the capital of restive Nangarhar, which borders Pakistan. Some areas of the province are a stronghold of the Islamic State group but Taliban fighters are also active there. It was the latest deadly violence to strike Afghanistan as militant groups step up attacks and US-backed Afghan forces intensify air strikes and ground offensives. The assault came days after suicide bombers and gunmen launched apparently coordinated attacks on two Kabul police stations Wednesday, killing at least ten people. The Taliban and IS have made clear their intention of disrupting the elections. Officials are concerned that a low voter turnout will undermine the credibility of the poll. Operation Al Khandaq will target US forces and ”their intelligence agents“ as well as their ”internal supporters“, a Taliban statement said in late April. But the Islamic State group has also stepped up attacks in recent months, particularly in Kabul. Nine journalists, including AFP‘s chief photographer in Kabul Shah Marai, were among 25 people killed in a double suicide blast claimed by IS in the capital on April 30. Kabul has become one of the deadliest places in the country for civilians as security forces struggle to keep the militants at bay following the withdrawal of NATO combat forces at the end of 2014.